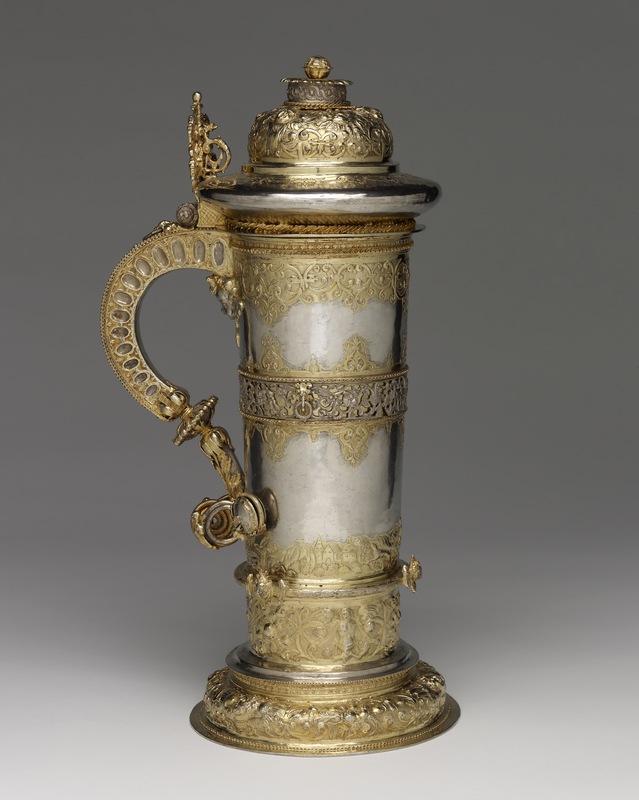 This form of tankard (Hansekanne) was popular with wealthy merchants in the Hanseatic trading cities of the Baltic. The arms of the city of Riga, Latvia, inside the lid are a later addition which suggest that the tankard was part of that city’s collection of silver plate. Tall tankard with cover; silver parcel-gilt and embossed; narrow cylindrical body with bands of embossed scrolls; pierced band in relief, landscape with huntsman and hounds; below the last a flange with three cherubs in relief, and above the foot a band of interlacing scrolls with terminal figures and fruit; spreading base with scrolls, trophies of fruit and cherubs in relief; cover with domed top, ornamented in same style as base; inside is medallion with engraved coat of arms, with lion supporters; handle with sunk ovals on the side and terminal figures on outer edge; terminates in spiral tendrils with fruit; thumb-piece of scroll design in openwork with female figure in middle; inscribed. Origin: Lübeck; first quarter of 17th century; mark of Engelbrecht Becker II. (i) The Imperial double-headed eagle punch (Liibeck), struck twice and partly overlapping (R3 3145). (ii) The five-petalled rose within a shield punch of Engel-brecht Becker 11 (died 1627); (R3 3193). These marks are punched close together near the centre of the base. Commentary: Lübeck, one of the leading towns of the Hanseatic League controlling the flourishing Baltic trade in the late Middle Ages, had a prosperous community of goldsmiths, but its very impressive achievements can scarcely be assessed today because the greater part has been destroyed, either during the Reformation or in the Napoleonic campaigns. To gain some impression of the huge scale and splendour of the works created in the fifteenth and sixteenth centuries by the goldsmiths of these rich trading cities in north Germany and along the Baltic coast, the historian is forced to refer to the famous Lüneburg Civic Treasure (A. Appuhn, ‘Das Lüneburger Ratssilber’, Lüneburg, 1956; Klaus Pechstein, ‘Goldschmiedewerke der Renaissance: Kataloge des Kunstgewerbemuseums Berlin, Band V’, Berlin, 1971, nos 1-27) and to the Moscow Kremlin collections (M. Bencard and G. A. Markowa, ‘Christian IV’s Royal Plate’, Rosenberg, 1988). Furthermore, the occasional spectacular commission has been preserved in the princely German ‘Schatzkammer’; the Grünes Gewölbe of the Electors of Saxony in Dresden, for example, contains the monumental and highly sculptural silver-gilt mirror frame completed before 1592 by Luleff Meyer and his journeyman Dirich Utermarke, probably in their workshop at Lüneburg (see J. Menzhausen, ‘The Green Vaults’, Leipzig, 1970, p. 88, pls 64-5; also J.L. Sponsel, ‘Das Grüne Gewölbe zu Dresden’, vol. II, Leipzig, 1928, pp. 237-8, pl. 44). It is a breathtaking tour de force, even when judged by the highest standards of the south, and was specifically made for the consort of the Elector Christian I. Such discerning and lavish patronage could only have been won by a well-established reputation. Unfortunately, the chance survival of quantities of Renaissance plate from the workshops of Nuremberg and Augsburg has tended to give these southern centres a false monopoly or, at least, an exclusive pre-eminence at the expense of their gifted, but less well-known, contemporaries in the Baltic area. By the end of the sixteenth century, both Lüneburg and Lübeck were being overshadowed by the growing commercial power of Hamburg; gradually, as the craft of the goldsmith in northern Germany became centred in Hamburg, the patronage of the wealthy courts of Denmark and Sweden was transferred from the workshops of Lübeck to those of Jacob Mores (master 1579) and his contemporaries in Hamburg. The dating of this Lübeck tankard has, therefore, to be determined on the scanty evidence of extant Lübeck examples and on the archival and comparative evidence of Hamburg goldsmiths. The tall, narrow silver tankard was a distinctive form of drinking vessel in northern Germany and especially in the Baltic towns, where it was very popular with the wealthy merchants of the Hanse towns - hence it became known as a ‘Hansekanne’ or Hanse tankard. The maker of this Hanse tankard was identified by J. Warncke in 1927 as Engelbrecht Becker II. He was the son of the Lübeck goldsmith Engelbrecht Becker the Elder (master by 1536, died 1587), whose beautiful armorial silver-gilt dish of 1563 decorated with Renaissance-style busts in medallions is preserved in the Armoury of the Moscow Kremlin (see G. A. Markowa, ‘Deutsche Silberkunst des XVI-XVIII jahrh, in der Rüstkammer des Moskauer Kreml’, Moscow, 1975, col. pl. 7). The few biographical details about Engelbrecht Becker II’s life published by J. Warncke indicate that he was active in Lübeck in the late sixteenth century; he became an alderman in 1613 and was buried in the city church in 1627. The almost identical but unmarked Hanse tankard, formerly in the Eugen Gutmann Collection and now in Baron Thyssen-Bornemisza's Collection in Lugano, has recently been catalogued as “Baltic area (Lübeck? ), anonymous goldsmith, circa 1580” (Müller 1986, p. 152, no. 41). So early a dating for an uninscribed and undocumented example of this well-attested Lübeck form of Hanse tankard seems puzzling, especially as Dr Müller has at the same time indicated that the Waddesdon Bequest tankard dates from “as late as 1610”. The differences between the two tankards are, however, truly minimal. The curious use of pewter for the applied openwork frieze on the Lugano tankard indicates a modern replacement, and the warrior finial is equally unlikely to be original. In most other respects they are remarkably alike. Dr Müller has claimed that the early dating of the Lugano tankard to “circa 1580 is suggested by the closely similar and probably contemporary example in the Kremlin by Claus Wiese”, and in a footnote she gives the following two references: G. Filimonov, ‘Pois’ Moskowskoj palaty (in Russian) 1885, no. 1676, pl. 284; and J. Warncke 1927, p. 180, pl. 43. However, Claus Wiese did not die until 1612 and, although he became a master by 1567, there is no inscription or other internal evidence to support the dating of this Kremlin tankard as early as “circa 1580”. The decoration on this Kremlin tankard (H. 39.5 cm) corresponds even more closely with the Waddesdon Bequest tankard than with the Lugano example: there is a very similar embossed hunting frieze immediately above the almost identical lower zone; a similar cherub head supports the handle, while the thumbpiece appears to be composed of a similar openwork design; only the domed cover differs slightly in form and decoration. In Filimonov 1885 the maker's mark, a W above a star within a shield, and the Lübeck town-mark are both reproduced at the end of the lengthy description of this Kremlin tankard. Were it not for this evidence, the Waddesdon Bequest tankard and this Kremlin version could undoubtedly be regarded as the work of the same goldsmith. Unfortunately, this Kremlin tankard has not been illustrated in Markowa 1975. However, the Armoury of the Moscow Kremlin contains another Lübeck tankard of similar form, though differing in many of the decorative details (G. Filimonov 1885, no. 2205, no illus. ; J. Warncke 1927, pp. 209-10, pl. 55). The two punch-marks on this second tankard are reproduced by both these authors, and the maker's mark of a human skull is attributed to Paul Winter, a Lübeck goldsmith whose name appears in the documents between 1610 and 1625. However, when this parcel-gilt tankard was most recently illustrated in colour (Markowa 1975, no. 21) it was published as the work of Klaus Wiese (sic) and dated to the end of the sixteenth century; unfortunately the punch-marks were not illustrated in Markowa 1975. Although the handle is similar, the thumbpiece, which is not an openwork design, is quite different and the lower zone of the body is strikingly dissimilar from the Waddesdon Bequest version. The simple, almost crude, band of engraved decoration around the lower zone of the second Kremlin tankard is a feature that occurs on two other very similar Lübeck tankards (illustrated in J. Warncke 1927, pls 46-7), both by members of the Hintze family of goldsmiths, active in Lübeck in the late sixteenth and early seventeenth centuries. Unlike the other Kremlin tankard, this Paul Winter (?) tankard in Moscow has survived with a pine cone (?) finial on the more gently domed lid. The general trend among these Hanse tankards as they develop during the last quarter of the sixteenth century and the first quarter of the seventeenth century seems to be towards a greater degree of decoration, especially of embossed and chased ornament, and towards an increased tapering inwards towards the base. The latter feature is a sophisticated element in the design which is not paralleled in contemporary silver, ceramics or glass anywhere in Europe, although a connection with Siegburg stoneware has misleadingly been suggested. Indeed, both the ornate 1588 Hamburg Coopers' Guild tankard and the plain 1591 Peter Henninges tankard have a straight-sided cylindrical form - not even the merest suggestion of the tapering form (both are preserved in the Museum für Kunst und Gewerbe, Hamburg - see ‘Bildführer’, 3, 1973, pp. 174-5; also ‘Goldschmiedearbeiten’ 1974, nos 7-8). On the other hand, the famous 1622 tankard by Dirich Utermarke of Hamburg (preserved in the Statens Historiska Museet, Stockholm) has a markedly downwards-tapering form and the entire surface is richly embossed and chased, including a hunting scene in the lower zone. Furthermore, as the shield on the finial of the cover bears the arms of the city of Riga (Rosenberg II, 1923, pl. 56; also Hayward 1976, pls 531-3) this handsome tankard appears to have been part of the City Plate. This slender chronological evidence is further supported by the illustrations in the 1614 broadsheet advertising a lottery that was held in Hamburg (Jewgenia Smirnowa and Bernhard Heitmann, ‘Gold und Silber aus dem Moskauer Kreml’, Hamburg, 1986, p. 41, where “no 14”, a typical Hanse tankard weighing “240 loth”, is depicted in profile, with a double-scroll handle, high foot and a cylindrical body tapering inwards and downwards. In the absence of more specific evidence about the chronological development of this tall tankard-form in Lübeck itself, there seems little reason to date the Waddesdon Bequest example, with all its exuberant and fully matured decorative elements, before the first quarter of the seventeenth century. A dating after 1600 is even confirmed by the design of the thumbpiece, which has many of the qualities of a piece of jewellery - for example, the pendant-jewel designs of Daniel Mignot, dated 1616 and published in Augsburg (see Joan Evans, ‘A History of Jewellery, 1100-1870’, London, 1970, p. 122, fig. 17). Phillips Sydney, 'Decorative and Fine Arts', Monday 27th and Tuesday 28th November 2000, p.70.